Dental bonding is a procedure in which a tooth-coloured resin material (a durable plastic material) is applied and hardened with a special light, which ultimately "bonds" the material to the tooth to restore or improve the patient’s smile. Unlike veneers and crowns, which are customized tooth coverings that must be manufactured in a laboratory, bonding treatments can be done in one office visit unless several teeth are involved. Another advantage of the bondings compared to veneers and crowns is that a minimal amount of tooth enamel is removed. Also anesthesia is usually not required unless the dental bonding is done to fill a cavity. Why Should I Choose A Dental Bonding Treatment? This treatment is one of the most effective methods to achieve damaged teeth restoration or to gain the desired smile in the shortest of time. 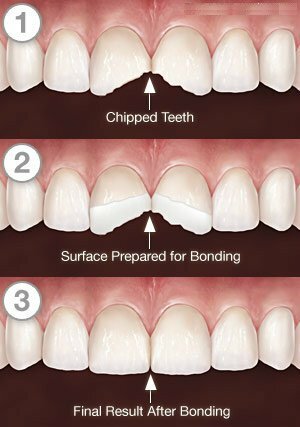 What is a Dental Bonding ? Dental bonding is a process that bonds a tooth coloured resin to the teeth to mask imperfections such as gaps between the teeth, teeth discolorations, or misalignment of teeth. It can also be used to cover or protect the root of a tooth after it’s been exposed by receding gums disease. To achieve a perfect smile, dental bonding treatment can last between 30 to 60 minutes per tooth. Selecting the dental bonding colour to match the natural teeth. Polishing the surface of the tooth to remove any debris (for a stronger bonding surface). Shaping of the tooth (this may not be necessary for closing gaps or in minor chip treatments). Application of a gel type material called “Tooth conditioner” to the tooth’s exposed surface. Application of the bonding agent. The final process of shining the “curing light” onto the treated tooth to harden the bonding agent. Trimming, shaping and polishing to match the sheen to the rest of the tooth surface. Brands and quality are number one priority with us. Everything we use is to european standards and are proven and registered trademarks worldwide. Id heard about Tourmedical when I was on holidays earlier this year. They had patients staying in the same hotel and I was watching the daily progress of how things were going for them, etc. I also know the staff of the hotel I was staying in well and they recommended Tourmedical to me also, so I had my decision made before I contacted them. I was very happy with the response I got from Majella , she was so helpful and re-assuring, as this was my life time dream and I wanted to be 100% sure of what I was doing and that they knew what I wanted and expected from the treatment. Dr Elcin was so friendly and listened to me when I was explaining everything I wanted and also that I was soo soo nervous. The clinic is outstanding, ive never been in a dentist with so much hi-tech equipment and the cleanliness was prestine, you could eat off the floor!! Im here now after a week and had a fab holiday plus my dream has come true, I even had a meltdown on my checking day, when I saw my teeth, that this was the new me and new beginnings. I now have the confidence I so wanted for so many years and its all down to the team at Tourmedical. I found tourmedical on Instagram and started following them, I made an enquiry and they got back to me with a treatment plan. I hated my teeth and never smiled, so was excited to get started. I booked my flight and Majella assisted me with booking my hotel as it was off season, she got a good rate at a hotel for me and my brother(who accompanied me) Omer picked us up from the airport in Izmir and took us to our hotel. We were picked up the next day, taken to the clinic and the process began, 4 days later, im smiling , just how I always dreamed I would. I cant thank Dr Elcin and her staff enough. Thank you.